Getting a great picture of your children can be downright humiliating. I’ve yelled, danced, and used the most spirited of spirit fingers, only to come to and remember I’m in public. Strangers might be staring at me, but my children certainly aren’t. They’ve wandered off. Still, family trips are full of moments you want to capture and share. Perhaps you dream of snapping that high pressure holiday card. For advice on getting good shots of the kids (and maybe even a family photo!) I turned to the professionals—photographers and stylists with kids of their own. Read on for their expert tips. Photographer Patrick Kolts Don’t try to focus on the perfect shot as much as telling a story. Think about looking back on your old photo albums: Is it the smile you notice, or the story behind the picture—the people, the event, the clothes you wore? Technology is going to continue to shift, but if you learn how to document a good story, you’ll be happy with the memories you capture. Photographer Callie Lipkin When shooting for clients we always scout, take test photos, and account for sun and weather. When I'm shooting my kids though, I just react to what I am seeing in front of me. I try to focus on an expression or moment I want to capture while keeping the background simple. Lean into it: Color coordination and a classic airport backdrop added fun and flair to this airport adventure. Stylist and Blogger Rosie Maxhimer I’m a sucker for matching to the point of being mildly annoying. That’s just an addiction for me whether or not a camera is involved, but it also happens to “set the stage” for pictures. I also try to set up whatever shot I want as much as I can before bringing in the “talent.” Toddlers have short attention spans, so it’s better to plop them into a ready-made scene than figure it out while they are sitting there. After a minute, they’ll be off to other things. PK I do ask my kids to pose on occasion. I usually will ask them to explore an area or try to reach, grab, or climb a specific thing. That way I can catch a certain composition. CL You may not be able to control your kids’ expressions, but you can keep two things in mind: The light and the background. If light is behind you, are your subjects squinting? If light is coming from behind, is your subject bright enough, or should you aim for a silhouette? Sometimes a photo is as much about the environment as it is the subject, so the kids don’t need to staring at the camera smiling. Magic hour: The light and background came together in Lipkin’s photo of an early morning hike in Arizona. RM Think like a child. I noticed my three-year-old Annabelle loved the self timer function on my phone. So if I setup a tripod and a timer, I let her press the button, run into place, and count out loud. It makes for a fun interactive experience and gets lots of giggles. I’ll ask “again?” and she almost always says yes because now it’s a fun game. Make it a game: Maxhimer’s daughter Annabelle set the timer for this picture in Idyllwild, California. Racing to get the shot was just a part of the fun. PK Our family posed pictures almost never look good, it’s just the law of nature. That being said, we’ve had luck when we encourage three-year-old Zella to ask someone to take our picture. When it’s her idea, she’s more invested. Along those same lines, ask the kids if they have any ideas for posing. They may want to do something silly, but the pictures will be fun. PK Teach your kids to fake laugh! Sometimes we just joke around trying out different types of laughs—laughing deep or laughing high or laughing with your mouth closed or with your teeth. Keep it silly. Use props: “Find fun flowers to hold or something that gets their attention,” says Maxhimer. CL Don’t forget that even photographers rope in professionals—child wranglers who are hired to get their attention, make them laugh, and even reposition them. On the road, enlist family or friends to be silly, yell loudly or even clap to get them to look your way. But the person with the camera can’t get involved, they just need to be ready to shoot. RM Never be afraid to ask strangers for photos. I usually scout out a friendly couple (vs. another family with their hands full) that inevitably tries to make your babies smile—it’s a natural instinct for most. Also ask to take the couple’s picture in return. Everyone will appreciate it! CL If a stranger is taking your photo, you can still set the camera up and give them light instruction. Tell them how close to be, whether to shoot a horizontal or vertical picture, and so on. And as a personal preference, I don’t always think everyone needs to look at the camera. RM For family shots, I work with a tripod and a little Bluetooth remote clicker that I use with my phone. PK I do a lot of "shooting at the hip” with my kids. I put the camera on auto focus and just interact with them while I shoot. Sometimes I even use my eyes as my guide instead of the viewfinder. I think it’s totally fine if some come out blurry or not perfect because it’s about capturing the memory of that moment. An emotion can still be displayed in a blurry photo, sometimes even better than a sharp one. CL For work, I only use the Canon Mark IV, which I absolutely love. When I’m traveling with my family though, I shoot almost exclusively on my iPhone 8. I have tried various smaller point and shoots—the Fuji X and Olympus Tough TG-4 (the latter of which I do like for underwater shots), but I don’t like any of them much more than my phone, and that is always on me. Tech tip: Here, Kolts used a wide lens to capture the scene as well as his subjects. PK Don’t shoot everything with a shallow depth of field all the time. It’s ok to shoot at f/8 (also the recommended aperture for street photography) when the light permits. It’s nice to capture as much as you can especially when you have multiple kids. CL No matter the camera, keep it close, and know how to make adjustments quickly. Shooting kids is all about working at the speed of light. Variety in angles, distances, and moments will help you narrate the experience through your photos. PK Also shoot with wide lenses. They can provide distortion that makes the photos feel more exciting or humorous. And I don’t recommend flash. Flash doesn’t work well with kids. RM Take your photos early in the day. Children are usually in the best, well rested mood early in the morning. Which means they are more patient, and less over stimulated from a long day of traveling. They’re also less likely to have the entire day’s worth of meals smeared on them. RM Sometimes, you just have to let it go. It’s just not going to work. You might employ creative tactics and have bribes at the ready, but things just won’t come together because your kids aren’t in the mood. Don’t push it. You’ll make yourself miserable and your kids will hate taking photos because you’re forcing it. So then just enjoy an action shot of your kids exploring. Or just embrace the reality and humor of the stage you are in—hello toddler tantrums! Rosie Maxhimer (@rosiemaxhimer) lives in L.A. and works as a food stylist and blogger. 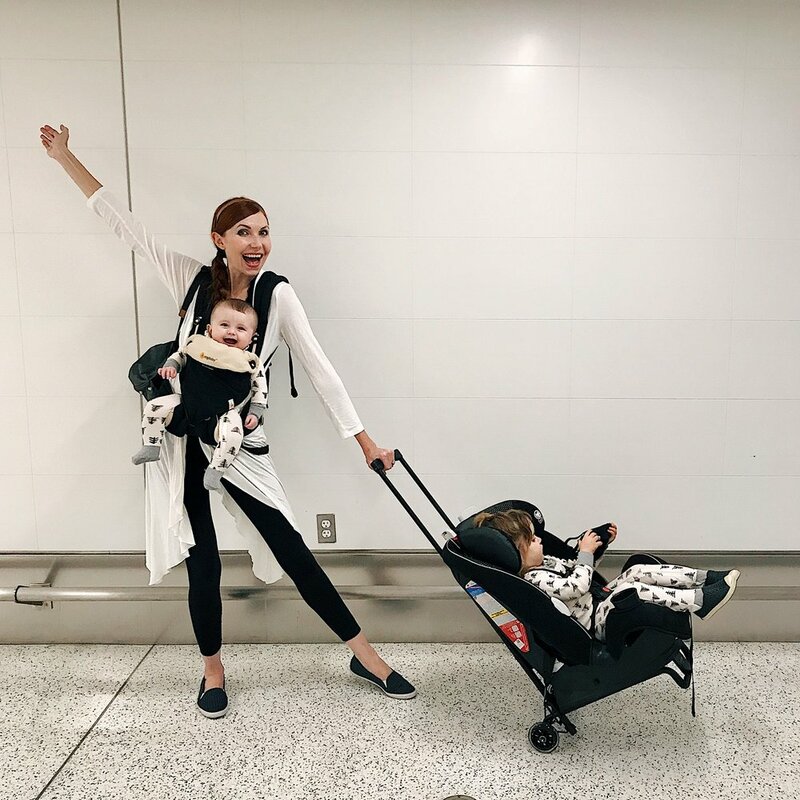 She has two kids—Annabelle, an energetic toddler, and Josephine, a mellow nine month old—and an outnumbered husband who works as the exhibitions manager for the Walt Disney Archives. Recent weekend getaways include Santa Barbara, San Diego, and Texas. What are your tips for TAKING GREAT PHOTOS OF YOUR KIDS? Let me know below!